NIA CHARLESTOWN NEVIS (October 09, 2014) — Prime Minister of St. Kitts and Nevis the Rt. Hon. 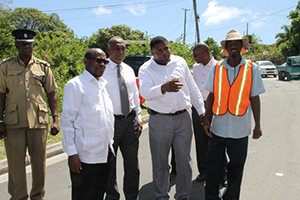 Dr. Denzil Douglas expressed his gratitude for the opportunity to see first-hand, the ongoing works on the Caribbean Development Bank (CDB) Nevis Water Supply Enhancement Project which had been partly funded by the Sugar Industry Diversification Fund (SIDF). He was at the time on tour of the project on October 08, 2014, after he accepted an invitation by the Nevis Island Administration (NIA). Dr. Douglas stated that some time ago the Administration sort Federal funding assistance and had given his commitment to assist. “I recall a few months ago when Minister Troy Liburd met with me, he indicated that the project could run out of steam without the necessary Capital support that was being required, since the CDB financial support was not going to take it to its full extent. “I gave a commitment that I was going to speak firstly with the Financial Secretary, to see how this could be incorporated into the overall water development project and she sort the support of the SIDF and the Board agreed that they would advance the necessary financial support, to ensure that the project was completed,” he said. 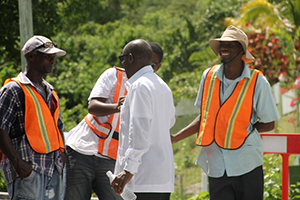 The Prime Minister noted that he believed water was key to life and it was his responsibility to assist the people of Nevis in a positive manner. “I am one of those who believe that water is life and my responsibility as the Federal Prime Minister, wherever I can impact positively on the lives of the people of Nevis and St. Kitts, so to would I do and that’s exactly what is happening in this case,” he said. Dr. Douglas also gave his impressions on what he has seen while on tour. “What has been very impactful on this tour, however, is the comprehensive nature of this project, I believe responding to this project to the water needs of the people of Nevis for a very long time, converting what would have been existing old wells and tanks and reservoirs and converting them into larger much more modern holding capacities and outfitting these with chlorination stations so that the water would be appropriately readied for the consumption of the people,” he said. “I want to thank Minister Liburd for the enthusiasm that he has demonstrated…I think that this is a case where he has been able to demonstrate his understanding of the job,” he said.